We have having a problem with KStars on Windows, and I tried with kate.exe as well same behavior. If you open Kate, and then close it, do you still have it running as a background process? I have read about your problem, but I have not been able to reproduce the problem. Are you having the same problem with this version of Kate? Are you comping your own kate.exe with Craft? What version of Qt are you using? 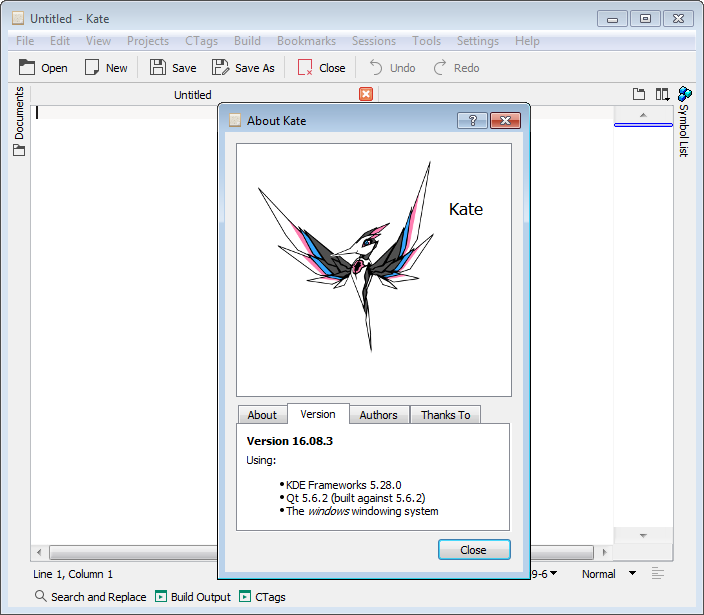 I’m compiling Kate against the stock installer libraries of Qt 5.6.2. Wanted to try it out, but… Please, next time you compile, use Windows XP-compatible target. Or use MinGW. I’m really curious why open source developers who develop native Linux apps with GCC don’t use MinGW on Windows when they decide to port, but adapt their programs to MSVC instead. Hi all, I am using kate on windows 10, and I messed all color schemas I can not return back to the default colors. I tried to uninstal and instal kate but the old settings are still here. Can someone point where kate store all settings on windows 10 OS. get an error after installed 17.04.1-KF35.34-64bit. ” lost api-ms-win-crt-runtime-|1-1-0.dll”, but I actually find the newly installed MS VC++ 2015 Redistributable (x64) – 14.0.23506. Does it start working if you run the MS VC++ installer? hi I am using Kate on windows and realy like it but totally messed the color schemes. I try to instal Kate again but all old settings are still there. How I can reset all my preference on windows 10, where color schemes are to just delete them. There are also other files there that are related, but deleting that file should devert the color scheme.